Spray Foam Insulated Cool Roof, with acrylic and silicone coatings are the most proven, durable and energy saving roofing systems available today. Users enjoy dramatic energy savings with a seamless, waterproof surface that is virtually maintenance free with these important benefits listed below. 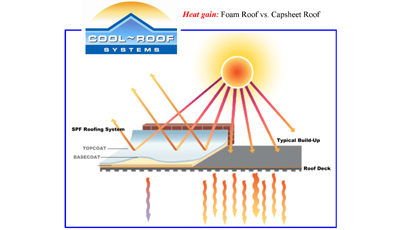 Cool-Roof Systems also offers High Energy Efficiency Spray-In-Place Foam Insulation for thermal and moisture control. Polyurethane Foam is the most efficient form of thermal insulation commercially available. The systems usually pay for themselves in 2 to 6 years through energy and maintenance savings. Cool Roof can pay for itself in 4-7 years through energy savings alone. 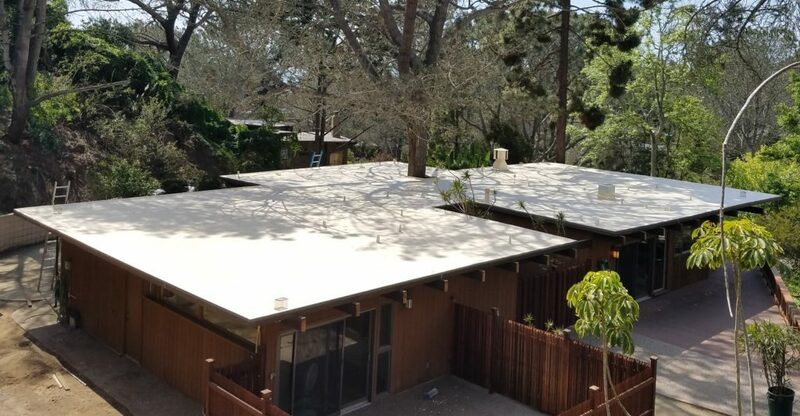 And because of Cool Roof’s tremendous durability, facility owners enjoy a 50-60% lower cost over the roof's 30-year life cycle. Provides superior insulation performance in extreme heat and cold. Inside temperatures are lowered by 10' - 20' F.
The new "Energy Efficient" requirements for commercial and industrial buildings take effect on October 1, 2005. Spray Insulated Cool Roof is already compliant! Cool Roof is completely seamless and weather resistant, eliminating leaks from laps or roof penetrations. No secondary metal flashing is required. Cool Roof restores even old and damaged roofs to waterproof condition. SPF has the highest customer satisfaction of any roofing system. SPF qualifies as a "green building material", and is eligible for many energy conservation rebates and credits. And since Cool Roof covers the existing roof, landfill usage for tear-off debris is greatly reduced.